Has Meghan threatened to carve her initials into Kate’s pretty face? PALACE sources have denied that the Duchess of Sussex accosted the Duchess of Cambridge in a quiet anteroom, held a knife to her cheek and threatened to ‘cut’ her. The rumours began after 34-year-old Prince Harry decided not to live with his brother anymore, which was widely thought to be very odd and a sure sign something was up. An insider said: “Kate is a beautiful, English rose possessed of infinite class and charm. 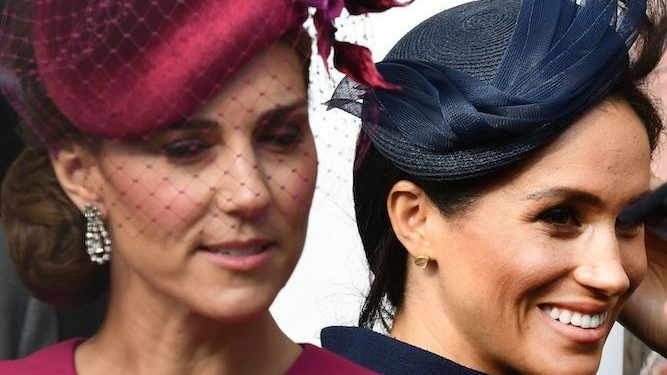 “Seething with jealousy, Meghan held a blade to her rival’s porcelain cheek, threatening to mar her perfection with a crude ‘MW’ and force Kate to be forever hidden away in a tower wearing an iron mask in accordance with Royal tradition. “Kate was about to retaliate, but thankfully an aide came across them and the pair pretended merely to be making delightful small talk, with their laughter chiming like little bells, as usual. “But as Harry said ‘What Meghan wants, Meghan gets, or she will not hesitate to maim or murder anyone in her way.’ That’s the full quote.